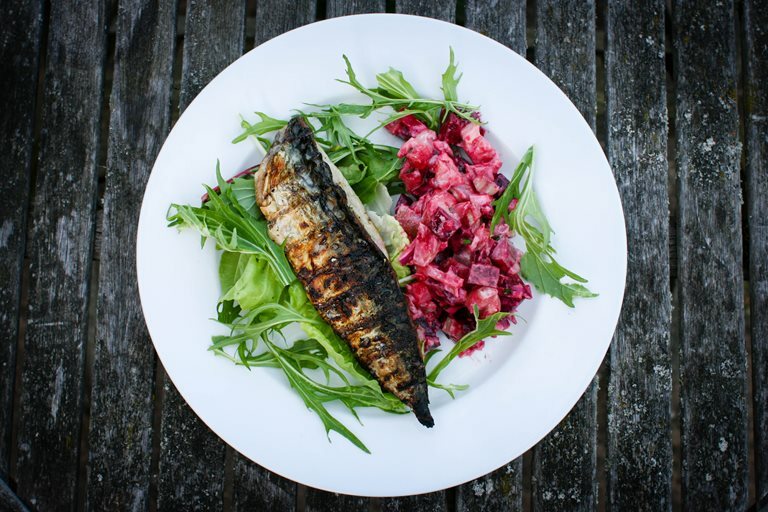 Monica Shaw’s colourful grilled mackerel recipe offers a slice of summer, pairing the fish with a glorious salad made from new potatoes and sweet, earthy beetroot. The beautifully mild nuttiness of the potatoes makes an ideal salad, with plenty of zingy additions to cut through the richness of the mackerel. Potato salad. It's ubiquitous at pot-lucks, picnics and barbecues, but so rarely memorable. But here is a potato salad that’s poised to change of all that. In this potato salad I employ beetroot to add a sweet dimension to the earthy potatoes. Meanwhile, a light dressing of oil, sherry vinegar and yoghurt give the salad a punchy zing and satisfying creaminess without the mayo-laden effect that most potato salads seem to suffer from. Add a little celery for crunch and minced chives because they’re delicious, and you have a sweet and tart potato salad that is the perfect compliment to grilled mackerel. As such, this recipe is ideal summer barbecues, but it’s equally comforting in cooler months when hearty rich food is the call of the day. I use Blas y Tir Pembrokeshire Early Potatoes for this, which have a nice fine skin and a nutty flavour that works well for potato salads. This potato salad is especially good the next day, after the flavours have had a chance to mingle and the potato has absorbed some of the dressing.